Marketers love WordPress. WordPress is the content management system (CMS) of choice for dynamic websites because it’s significantly reduced the cost of software. WordPress software is free to download and you can modify it to meet your marketing and operational needs. As a result, an entire ecosystem of plugins and themes has emerged around WordPress eliminating the need for programming to add new website capabilities and features. WordPress plugins add functionality to a WordPress site that’s cheaper than building yourself. WordPress plugins can access and modify files and databases on your webserver. About 40,000 plugins are available in the official WordPress Plugin Directory and tens of thousands of others are available from independent WordPress development shops. I highly recommend getting your plugins through the official directory since it provides ratings and reviews, verified authorship, FAQs and other important details. Understand that every plugin adds to your site’s load time. I mention this since site speed is an important factor for search optimization. 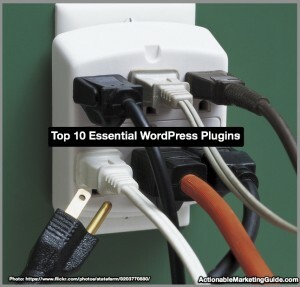 Here’s my list of the Top 10 essential WordPress plugins for marketers. They’re intended for self-hosted WordPress websites; most aren’t available for websites hosted on WordPress.com. All are from the official WordPress directory (links included) and all are either free or freemium. A few require you to have an account on a third-party service such as Twitter. Yoast SEO has become the standard plugin for search engine optimization. It’s a complete package of tools addressing how to make the search bots love your website. Yoast adds a panel to the post editor where, if you enter a keyword or key phrase, the plugin analyzes the post’s content and meta information to ensure the keyword appears in all the right places. It also allows you to craft the post’s summary that appears on the major search engines’ result pages (or SERPs). Further, the Yoast SEO plugin generates the correct tags for your Google Analytics account, Google Search Console (formally: Webmaster Tools), Bing and Yahoo registrations. It dynamically creates XML sitemaps and robots.txt files. It also generates the Open Graph tags that Facebook, Twitter and other social media platforms seek when readers share your post. You should backup your website on a regular schedule. Take my word for it: You don’t want to risk losing your content. It’s much cheaper and easier than the risk of loss. Configure this plugin to backup your WordPress database and/or files, automatically, and on multiple schedules. For example: you might want to backup the database weekly but only backup the files (which don’t change often) on a monthly basis. Backup files can be saved on the webserver, emailed to an email address, saved to the cloud or downloaded. The dashboard interface displays a list of saved backups including links to restore your WordPress website from a backup. While there are many backup plugins that have some or all of the same features, WP-Backup is free. An editorial calendar improves your blogging and content creation process. The Editorial Calendar plugin displays post titles, publication statuses and authors in a configurable calendar grid. While media entities have done this for years, the Editorial Calendar plugin gives you a visual planning tool for drafting and scheduling future posts, allowing you to move (via drag ’n’ drop functionality) post publication dates. The Editorial Calendar can do everything that the standard WordPress dashboard post list can. Mouse over a title shows a mini-menu as in the standard post listing and Quick Edit pops up a mini-editor for quick changes. Like your email inbox, a WordPress database can get filled up with a lot of crap – spam comments, extra post revisions and mysterious transients. This has a direct effect on your blog’s performance. WP-Optimize allows you to selectively choose what you want to eliminate as well as whether you want to optimize the database (Translation: consolidate and compact its records.) If your WordPress website(s) has a lot of activity, you can set a regular schedule of cleanup/optimization. Additional plugin panels provide a table by table picture of your database and where problems might lie. At a minimum, do a database cleanup and optimization whenever you do a major WordPress update. Every website should have a Google Analytics account to track visitors, where they come from and what they’re viewing. This handy plugin displays your important analytics on your WordPress website dashboard and post listing panels. The plugins configuration panels allow you to choose which user roles (admin, editor, author, contributor) can see the statistics. You can also track events like downloads, mailto and outbound affiliate links. On the post listing panel, you can click an icon to display single post stats and adjust the time span from 1 day to 3 years or watch visitors arrive in realtime. If your blog is open for comments then people will comment. So will spambots. Filter out spam comments to reduce your workload and keep your conversations spam-free. Akismet, a product of Automattic, is simple to configure but requires you to register with Automattic and get an API key. The basic plan for personal, non-commercial sites and blogs allows you name your own price. Monthly plans with extra features run from $5 to $50 per month. Writing great blog posts is the beginning of your effort. To get people to read your content requires social media. Here’s the data on social media distribution. ShareThis’s free service via its WordPress plugin provides buttons for visitors to share a post with their followers, increasing your content’s reach. ShareThis also provides tracking and reports to see which social media platforms are performing best for your business and who your top influencers are. ShareThis has a lot of configuration options most social media platform. You can choose button style, position buttons wherever you want, and show real-time counts for social proof. TinyMCE is WordPress’s page/post editor (aka Visual Editor). Despite complaints, there are good reasons to like TinyMCE. It’s free. WordPress can only include other software that uses the same open-source license that it uses. TinyMCE is the best, free, embedded, cross-browser, web content editor available. It’s everywhere, not just WordPress. Customized versions of TinyMCE are on social media platforms, email marking websites and other web-based services. Further, it has plugins. Like WordPress, you can add new features and customize Visual Editor’s interface to suit your own needs and tastes. TinyMCE plugins (also free) are packaged as WordPress plugins available on the Plugin Repository. Want to control your font families and sizes; sub and superscripts; add a find and replace function? TinyMCE Advanced provides these along with options to override WordPress’ default handling of paragraphs and line breaks. WordPress does what a Content Management System (CMS) does best: generate dynamic content. But, not every page on your website has truly dynamic content. In fact, once they’re published, most pages and posts are static and never change as are most page components, such as images, stylesheets and scripts. Caching speeds up your website by taking the static components and saving them on disk. Once published, each subsequent request for a page or post returns the static disk file instead of returning to WordPress’s engine to generate a fresh copy. Provides a choice of caching methods to suit different needs. Deals with comments and users intelligently. Handles page components from a content delivery network (CDN). Have a webmaster examine your website when you configure any caching plugin. Small changes can make a big difference in caching efficiency. Therefore, test before and after caching performance. Done right, WP Super Cache saves your website from crashing when a post goes viral. Responsive design is a must to attract mobile-centric readers. But, you just can’t make an existing website responsive; you must design an experience that works across most devices. This is hard to do even when you start with a “responsive” theme for your WordPress website. It’s harder still when your website features rich content with a complex structure. WP-Touch to the rescue. This free plugin provides an alternate theme for mobile devices. Your mobile site visitors get a responsive interface. The nicely structured settings panels for the Dashboard have plenty of options to fine tune the mobile experience. You can even redirect mobile users to a different home page than the desktop one. I particularly like that it allows any visitor, via a button added to the page footer, to switch to the desktop view. WP-Touch’s Pro-version costs $69.00. It comes with a year of pro-support and updates. The Pro version offers more themes, smart ad integration, caching and more flexible control over styles and typography. Any plugin’s functionality is shaped by its creator’s perception of particular problems and potential solutions. Since their vision may not match your needs, allocate time to research documentation and seek support from forum discussions to learn the best practices for the plugins you select. These Top 10 Essential WordPress plugins all work with each other. They provide what I’ve found to be the essential plugin set for most WordPress websites. Since variations in WordPress plugin functionality and code quality abound, be careful not to overload your WordPress installation with too many plugins that do similar things. I omitted JetPack by Automattic. It provides the full gamut of plugin functionality to blogs hosted on WordPress.com. You can install JetPack on a self-host WordPress website but it still requires a WordPress.com account to access many of its features. Larry Aronson is Actionable Marketing Guide’s webmaster. Aronson has over 40 years of systems experience including the firms: IBM, Boeing, Columbia University and CBS News. Need help with your WordPress site? Contact Larry Aronson. A seven step guide and checklist to ensure success. Employee-shared content increases reach 10x and engagement 8x. That’s why leading brands are launching Employee Advocate Marketing programs to drive the marketing metrics they care about most, including increased awareness, social engagement and new customers.